Selecting part of the mesh. On the left: the Lasso is used to select the head. On the right: the result. 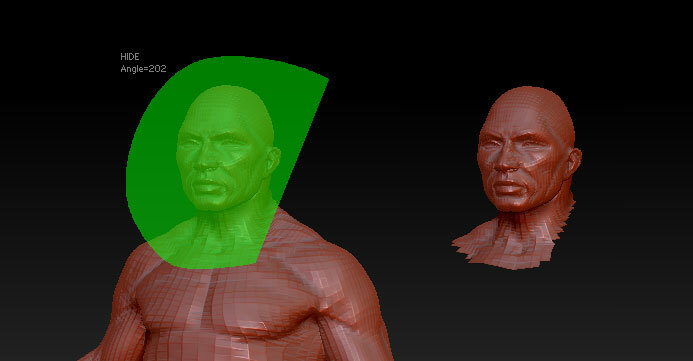 You can show and hide parts of your mesh to make it easier to work with. For example, you might want to work on just the head of a character – it makes sense to hide the body so you can concentrate on what you are doing. The Clip brushes operate on the mesh to clip or slice it in various ways. To learn more see Clip Brushes. There are several options for controlling a partly visible mesh. These mesh visibility controls are in the Tool>Visibility sub-palette.